there is no easy way to sugar-coat this – alcohol is a toxin/poison. Now that we have established that let’s look at how to minimize damage during ‘party time’. It’s really important to bear in mind that if being exposed to a lot of omega-6 polyunsaturated fats (as in margarine, canola oil, flaxseed oil, grapeseed oil, sunflower oil, chips at restaurants – junk fats in processed food) means that you will have increased liver damage in response to alcohol. Stable fats like butter, coconut oil and animal fat protect against liver damage and these are way preferable to the damaged ones. Let’s be honest, liver damage is inevitable with junk fats anyway, but the damage will be exacerbated by alcohol. Moral of the story: don’t eat junk fat, and of course – always limit alcohol. 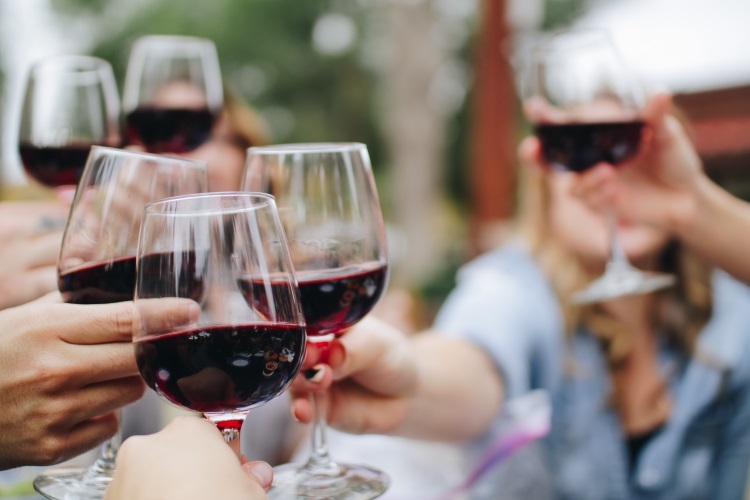 So you have been invited to a big dinner party, wedding, celebration – and you don’t want to be a party-pooper, but want to fully ‘take part’ – well here are some ideas to help you do the least damage to your precious liver along the way. Take extra antioxidants such as a glutathione precursor like NAC, or straight glutathione sachets (we stock these and I take one daily for good health anyway). I would go so far as to say do both, and add in at least 1000mg of vitamin C. Glutathione is the most important antioxidant when it comes to metabolizing alcohol. NAC as a precursor will work best with vitamin C as you enable the body to make glutathione from this concoction. When people are dangerously intoxicated, intravenous glutathione is used in hospitals to prevent death. Magnesium is another good nutrient to take – 200-400mg of magnesium is advised as alcohol depletes magnesium; that’s why you often get leg cramps in the wee hours after a party. Have either some liver, a few eggs or a few egg yolks. These provide you with precious choline which your liver will use up very quickly if drinking alcohol – its excellent preparation for the party. Alcohol metabolism relies heavily on choline stores and to be extra sure, you could also take a choline supplement. Choline is also one of the ways to treat a fatty liver (usually brought on by alcohol). Choline is so powerful it’s said to protect a fetus in the womb against the effects of alcohol. However please don’t EVER drink alcohol if you are pregnant or think you might be. Just before you leave for your dinner party, take a tablespoon of coconut oil. If you have none of this, then extra virgin olive oil or extra virgin avocado oil will do. This protects against alcohol-induced oxidative stress while the healthy fats protect against alcohol-induced liver injury. The oil also coats the stomach lining and reduces alcohol absorption there. Alcohol is one of the few things absorbed by the stomach so slowing its absorption allows the liver to neutralize its effects without being overwhelmed. Apart from the eggs/egg yolks try to eat a light meal so that you have food in your stomach before ingesting any alcohol – this is so And please add salt to your food too – this way you will prevent the conversion of alcohol into the highly toxic acetaldehyde which forms and completely overwhelms your body’s antioxidant defence. Just don’t EVER drink on an empty stomach, E.V.E.R. Here’s one you’ll like! Have a few squares of very dark chocolate – the polyphenols in chocolate may help a little to prevent liver injury. If you can squeeze in some turmeric, ginger, berries or beets before leaving, this will help to fortify you well against the ethanol too. Another overlooked substance which is enormously protective is collagen. You can get this in powder form (I prefer my grass-fed Pure Hydrolysed Collagen from my online store at sallyanncreed.co.za) as the high glycine content reduces lipid peroxidation and antioxidant depletion. If you can’t afford my collagen which is unadulterated, use my brand of gelatin – it will have a very similar protective action. Lastly, have a cup of green tea – packed with beneficial and protective polyphenols, or take an L-Theanine capsule (also available from my online store). Always choose the best quality alcohol (ie. Organic wine or other alcoholic beverages) – don’t drink rubbish…. It’s like eating junk food only worse. Dilute it with sparkling water – it improves hydration and even improves the taste of red wine. It’s interesting to note that the Romans declared undiluted wine was only for Barbarians! For every glass of alcohol, drink a glass of mineral water or sparkling water with a pinch of salt. Preferably only have one glass, but if you do have more, have this glass of water in between each glass. Women usually have smaller bodies than men so an equivalent amount of alcohol in a man is diluted by his larger body fluid volume whereas the smaller women with a smaller body fluid volume will feel the effects of the alcohol more as it is less diluted so women generally can become more intoxicated than men drink for drink. Drinking water with or between drinks will help both men and women for its diluting effect. Take a magnesium supplement of at least 200mg, more if you are used to taking more. Make up another batch of lemon, Himalayan salt, water etc that you would have had last night. Have a brisk walk and then a hot shower followed by a cold shower blast. It’s not necessary to drink when you go to a party – sparkling water is fine and looks like vodka, so people think you are drinking anyway. However, there are some celebrations which you may wish to partake in – an outing with friends, a wedding, Christmas, New Years’ day etc. Try to keep the celebrating to a minimum, and if possible, no more than one glass. Many people (especially Paleo enthusiasts) don’t touch alcohol so you’ll be in good company if your friends are Paleo people. But if you wish to indulge, do so mindfully and don’t over-do it. Cheers!